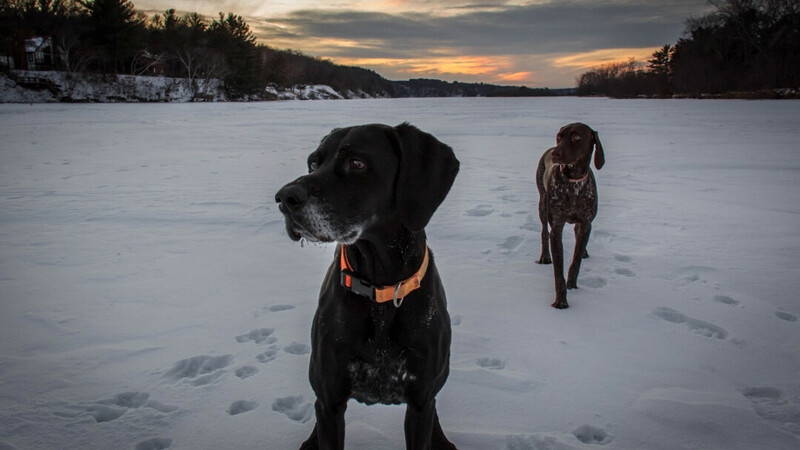 Justin Patchin’s pups, out on the Eau Claire River. At dusk, I take my two German shorthaired pointers for their usual after-work walk. They need this daily discharge of pent-up energy. Especially the puppy, whom my father has nicknamed “Zip-code” because of her penchant for pursuing far-off places. Truth be told, I need this walk too. It’s an opportunity to defrag my brain and straighten my spine after hours of sitting in front of a computer screen. Plus, it’s February, so any time spent outside is time well spent. I live on the banks of the Eau Claire River, so this time of year I have miles of off-leash dog park right out my back door. Today is one of the rare days this winter when we’re getting measurable snow. In fact, there are nearly white-out conditions as the dogs and I set out onto the frozen water. While the dogs run, I have the usual miscellany of menial disturbances running through my mind. But the cold, fresh air is helping to clear things out. The river here is as wide as a football field is long, and as I approach its 50-yard line, still lost in my thoughts, I’m abruptly jolted to reality when my left foot breaks through the ice. Lucky for me, the water is less than a foot deep – crisis averted. But then I break through again, and panic creeps in because I don’t know which way to walk to stay on solid footing. I know the depth in this part of the river varies unpredictably, from a few inches in one spot to 5 or 6 feet only a yard or two away. The current, too, is erratic – generally slow moving, but the pace picks up in places where the water is forced to circumvent ever-changing underwater dunes. I conclude the best course is to re-trace my steps, a strategy that keeps me on the snowy side of the ice and leads me back to land with only two wet feet. I first ventured onto the frozen Eau Claire River just weeks after moving to the property. I pulled my not-yet-one-year-old son behind me on a pink plastic sled, determined to expose him early to the beauty of winter in Wisconsin. Upon returning to the house, while in the midst of removing our many layers, the phone rang. It was a concerned neighbor I had not yet formally met calling to warn me of the unreliability of the ice. She relayed a story of a dog that had drowned when it fell through the ice the year prior. I expressed my gratitude for her thoughtfulness and assured her that I was a seasoned winter river navigator and would never take any unnecessary risks, especially with my toddler in tow. But she was right to be worried. I do have a troubled history when it comes to rivers – frozen or otherwise. When I was in high school, I had a run-in with another poorly frozen body of moving water. A friend and I were traversing the Partridge River in northern Minnesota. It was late March and the sun was high in the sky and the temperature was well into the 40s. He and I had crisscrossed this part of the river several times previously that winter, in search of beaver pelts and northern pike fillets. We labeled the spot “the land of the perfect pine trees” because there were several young balsams near the water’s edge that seemed made by Mother Nature to bear Christmas ornaments. When we first ventured onto the ice that year, we did so cautiously, checking the thickness of the ice with an axe every few steps. It was solid. Each subsequent trip we became more confident and less careful. Adolescence has a way of making one feel bulletproof. On that warm spring day, as we neared the middle of the river, I looked up at my friend a step or two ahead and noticed that he suddenly seemed to shorten by an inch or two. Pointing at his feet, I yelled, “You just dropped down!” He looked at me, then at his Sorels, and before he could react he broke through the ice and vanished from view. He popped back up in a panic, flailing his arms while trying desperately to tread water with the added weight of his wet winter clothing. He struggled to speak while gurgling ice water, but it was obvious what he needed. I inched toward him and reached for his hand, but then I too broke through. My friend continued to freak out, but for some strange reason I started to laugh. Maybe it was the sheer craziness of the whole situation, but I wasn’t scared at all. I reached for the edge of the ice and tried to pull myself up, but I kept slipping and the ice kept breaking under my weight. Finally, after what seemed like an eternity, I was able to clamber onto a solid ledge. I reached for my friend and pulled him onto the ice with me and we carefully army crawled to the safety of the shoreline. A couple of years earlier, on a different stretch of that river, I was rock-hopping with friends when I slipped and fell in. I went all the way under and still didn’t touch the bottom. The water was cold and swift from spring run-off, but I managed to dog paddle my way to the rocky shore. When I emerged, I was dripping with water and blood. It turned out that I smashed my lip on the rock as I went down. I still bear the scar to prove it. Despite all of these examples of reckless river behavior, I do respect these waterways, especially in winter. Moving water always carries with it risks. Yet they are so easily ignored. This is particularly true when the dangers that await are covered in a seemingly protective, if veneer-like, coating of ice. The Siren song is often too sweet to ignore. Rivers have long been a means of conveyance, and I am drawn to them for their ability to take me to where I need to be – even if life-threatening experiences are needed to emphasize the point. I should’ve known better on my walk today. The fact that someone was kayaking this section of the river on Christmas Day should’ve been a signal that ice conditions were spotty this winter. The dogs and I will circumnavigate that spot, at least until after the next extended period of subzero temperatures. And even then, we will roam the river with a renewed appreciation for the conditions. Or at least I will. For a while.